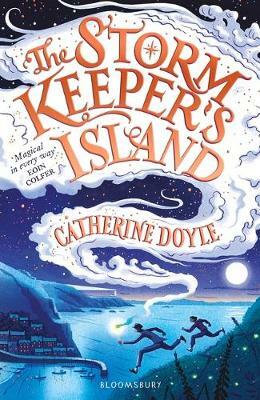 The Storm Keeper’s Island by Catherine Doyle is the #PrimarySchoolBookClub read for August, and was also the Waterstone’s Children’s Book for July 2018. Some people might be aware of Catherine Doyle through her Young Adult trilogy, Blood for Blood, but this is her first foray into middle-grade novels (age bracket 9 – 12). The Storm Keeper’s Island was inspired by Catherine’s real-life ancestral home of Arranmore Island, where her grandparents grew up, and while I confess that I struggle sometimes to get into fantasy-style adventure stories, this is a fab, magical story, which has a feel of ancient lore. This is such an accomplished adventure story. Catherine Doyle’s writing is so rich and wonderously atmospheric, it draws you in right from the first page – it’s almost like the book itself possesses magical powers (maybe it does!…). While it’s a fantasy adventure, it feels a lot more grounded than other fantasies I’ve read and I think that this is down to the author weaving elements of truth into the story: Arranmore exists in real life, the rescue of the SS Stolwijk actually took place (and Catherine’s great-grandfather was a member of the life boat crew) and her depiction of Malachy’s Alzheimer’s is written from a position of experience (and skilfully and sensitively addressed) as her grandfather also has the disease. The story also has a ‘timeless classic’ feel to it, and, indeed, an ageless one too: at times I had to remind myself that it was written for children rather than adults. In fact, once I’d finished reading it, I was ready to open the front cover and start all over again. In three words I would sum up the book as one of adventure, family and courage and I can see it appealing to a wide range of readers. Aside from the adventure angle, there’s some humorous banter, sibling frustrations and lots of lovely interaction between Fionn and his grandfather; there’s also a touching and poignant section where Fionn gets to meet his Dad who died before he was born. It would be a great read to share with the family, or as a class read at school. Finally, I must mention that there’s good and bad news: the good news is that there’s a sequel planned (hurray! ); the bad news is that we are going to have to wait ’til July 2019 to read it (boo…).